Step aside, grown-ups – the kids are back in business at this awesome arts festival. Theatre Lab is designed to introduce children to the world of theatre by connecting them with a qualified theatre professional. Games and exercises will help stretch your imagination and offer a glimpse into the world of physical theatre, improvisation & collective creation. 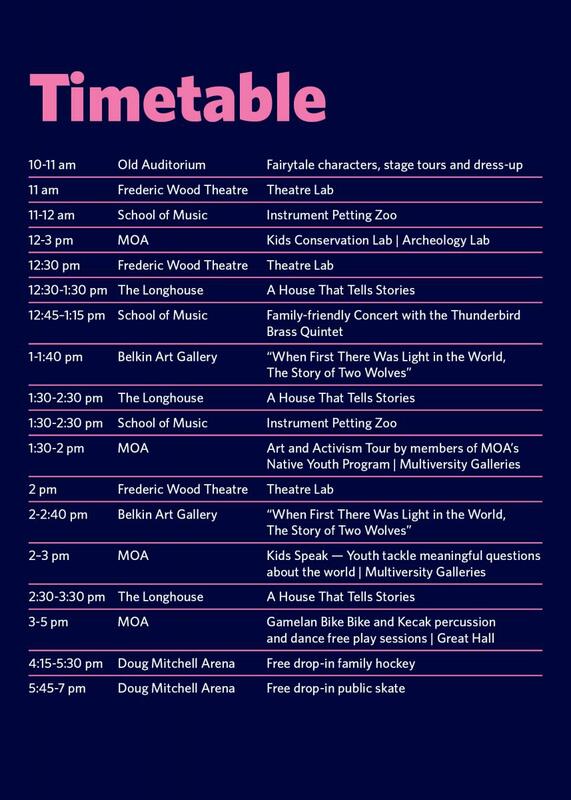 It’s a day of museum fun for the whole family at MOA, where kids and youth can take part and take the lead! Enjoy tours and discussion panels led by youth; get grooving with music and movement workshops, and learn about conservation with hands-on activities. Opera: Fairytale characters, stage tours and dress up! Take a journey through Mozart’s 'The Magic Flute'. Meet a handsome prince, a beautiful princess and a mysterious Queen who trust in the power of music to lead them into an exciting adventure. Come on-stage after to dip into our tickle trunk for photos with our cast – or take a tour of the opera house. All instruments are fair-game for kids to see, hear, touch and play. There will be helpers to introduce the instruments, show kids how to hold them and make them sound. Everyone will make music! Take a trip around the world though music led by the Thunderbird Brass. This brass quintet is made up of young, enthusiastic students from the UBC School of Music. Some have come to study at UBC from far reaches of the world including Brazil and Japan. At home across styles from classical to Star Wars the quintet is preparing a very fun musical adventure. The Dzawada'enuxw people have lived on the lands and water ways of Kingcome Inlet since the beginning, long before settlers came to British Columbia. The Dzawada'enuxw origin story describes how two wolves, Ḵawadiliḵala and Ḵwalili came to the area and how the clans descended from them. Join language researcher and educator Jaymyn La Vallee as she talks about the figure of the wolf in the Belkin Art Gallery's current exhibition, "Hexsa'am: To Be Here Always". Musqueam youth and the children of the Longhouse Community will welcome families and tell stories of the land, the house posts, the art and the building. Games, activities and crafts will reflect our gratitude for living and learning on the traditional, ancestral and unceded territory of the hən̓q̓əmin̓əm̓ speaking Musqueam people. There are two types of tickets available: family and individual passes. Each family pass comes with 2 adult and 2 kids (under 12) all access passes and a $10 food voucher. Tickets are limited so purchase yours now and RSVP on Facebook. Take a look at the full timetable below and plan your day accordingly. Please note that some events can only accomodate limited numbers, and will offer admittance on a first come, first serve basis.